About two weeks ago, I was on my way to another food event. The food event being the media opening of a bar, I expected that it would be more drinking than eating. I have learned to have a snack before showing up to the event. Being in the Queen West area, I didn’t have a shortage of possibilities. I randomly picked Bathurst and Queen and started walking west. 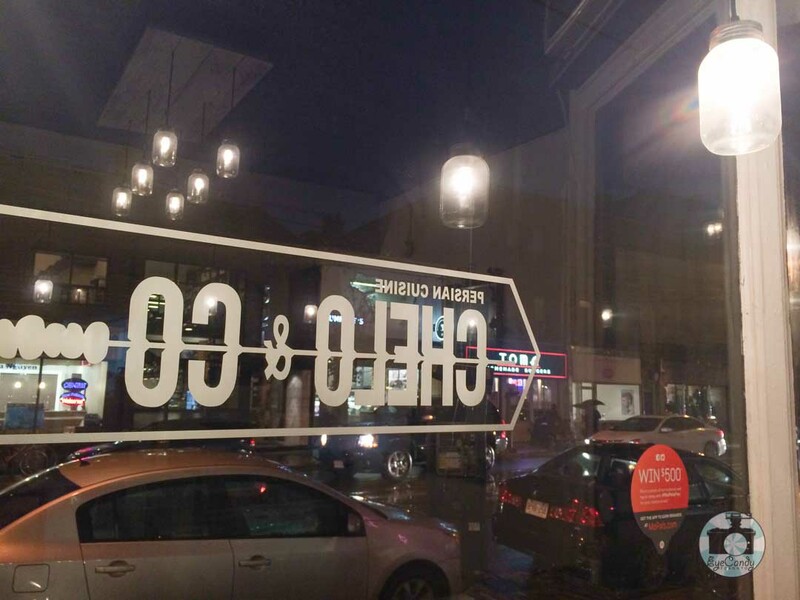 Somehow, I found myself stopping at a brightly lit take-out place that was Chelo & Co. I needed a snack and it looked like the place that would give me just that. Walking in, things are simple enough. Menu right at the centre, counter with a cashier, meaning most purchases are to go, but should you decide otherwise, there were a few bar stools by the window. One of the reasons why I walked in was that Chelo & Co is Persian. After scouring their menu, I see the usual suspects and I knew right away what I wanted, Koobideh! I didn’t have the time to eat a platter style koobideh but I knew a koobideh wrap would definitely hit a spot. The wait didn’t take too long. When it came, I was given a slim cylindrical wrap. I don’t know why I expected something bulkier than what I received but it does make sense as koobideh is molded into the length of long metal BBQ skewer. The aroma wafted around me as I made my first bite. It was so satisfying as the grilled meat was very well seasoned and moist. My plan of only eating half the wrap went out the window and I finished every morsel.